Poul Hartling (14 August 1914 – 30 April 2000) was a Danish diplomat and politician. He was born in Copenhagen. He was a member of the Liberal Party. 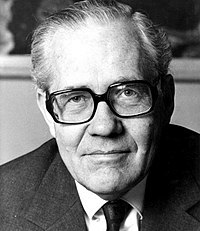 He was the 22nd Prime Minister of Denmark from 1973 to 1975. He was also the 5th United Nations High Commissioner for Refugees from 1978 to 1985. In 1981 Hartling accepted the Nobel Peace Prize on behalf of the UNHCR. Hartling died on 30 April 2000 in Copenhagen at the age of 85. This page was last changed on 20 August 2018, at 09:00.